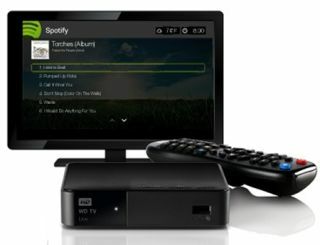 Western Digital adds Spotify to wireless streamer range | What Hi-Fi? Western Digital has teamed up with Spotify to add the popular music streaming service to its latest wireless streaming media players. The newest versions of the WD TV Live and WD TV Live Hub streamers incorporate Spotify so Premium subscribers can create and manage Spotify playlists, share songs with Spotify friends and see and subscribe to friends' Spotify playlists. The WD TV Live streamer is on sale in the UK for £90.